Holidays in Fuerteventura bring you wonderful beaches, sunshine, and warm weather all year round. Located off the north west coast of Africa, this island belongs to Spain, offering a wonderful combination of European and African cultures, cuisines, and architecture. Fuerteventura is home to some of Spain’s best beaches, with over 150 to choose from around the island. 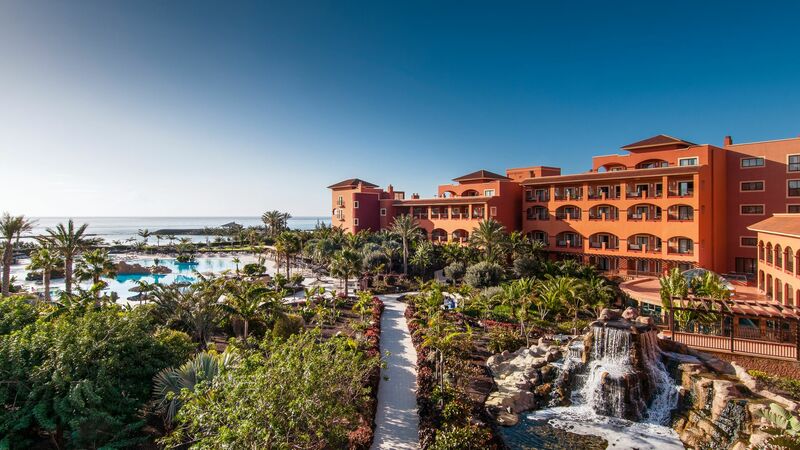 Choose from family friendly, lively resorts, home to light golden sands, watersports, and plenty of amenities in Caleta de Fuste. Alternatively, those wanting to enjoy wild, open beaches with secluded spots, where the only footprints you’ll see are your own, will love holidays in Jandia. Corralejo brings you the best of both worlds, with a lively promenade just off the beach, a large town full of shops, bars, restaurants, and swathes of sand stretching from the ocean to the dunes behind. Whether you’re travelling in a couple, with the family in tow, or with adventurers, you’ll find a beach for your holiday type in Fuerteventura. If you’re looking for luxury holidays in Fuerteventura you’ll find plenty to keep you satisfied. The island is home to some fantastic restaurants, where foodies can choose from a huge selection of menus, offering everything from traditional Spanish tapas to sushi and Moroccan favourites. Those wanting to explore the area’s history can head to little fishing villages where there are narrow streets winding through upmarket shops, cafés, and bars, or visit the old town of Corralejo. 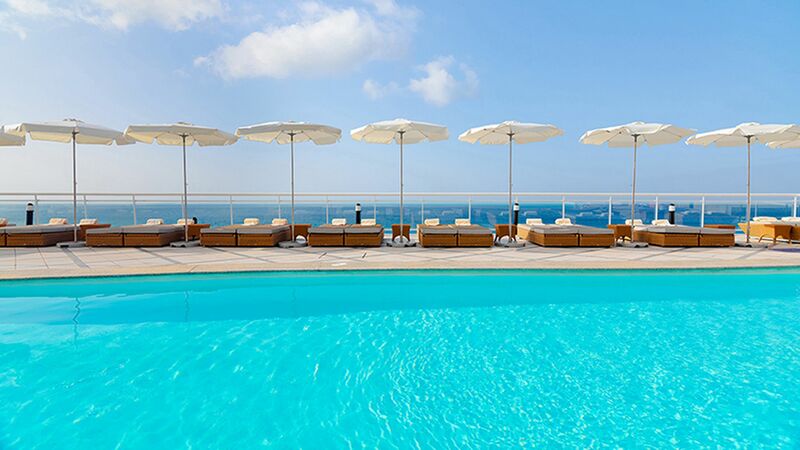 The Sheraton Fuerteventura Beach Golf and Spa Resort offers wine tasting in the evenings and features an impressive Thalasso spa. The Gran Hotel Atlantis Bahia Real offers family suites, large rooms, nine bars and restaurants, and many other luxuries that will enhance your family luxury holiday. 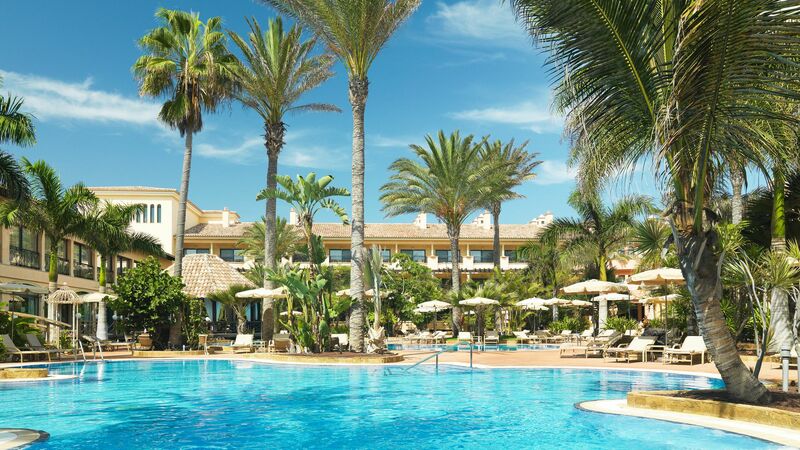 Book your trip with Sovereign today and we’ll help you find the ideal luxury holiday in Fuerteventura. Speak to one of our Trusted Advisers who will take the time to understand your needs before recommending one of our tried and tested properties. A member of our team has stayed in each of the hotels to ensure it matches up to our exacting standards. Fuerteventura enjoys warm temperatures and sunshine throughout most of the year. There are over 150 beaches to explore, with plenty to do whether you want to relax on soft golden sands or you prefer to join in with the games, activities and water sports on offer. Caleta de Fuste is a well-heeled resort on the east coast. Scuba diving, sailing and windsurfing launch from the marina, while luxe hotels are settled beside the sandy bay. Northerly Corralejo is the biggest town on Fuerteventura. Its beachfront promenade is in touching distance of the island’s famous wind-whipped sand dunes. Jandia is a lighthouse-topped peninsula in the south of Fuerteventura. Miles of sandy beaches frame the hook of land, plus there’s a beachside town with a restaurant-packed promenade. Corralejo beach is part of Corralejo Natural Park – a region to the north of Fuerteventura that shelters Sahara-style sand dunes and miles of wide white-gold beaches. It’s all finished off with views that stretch right across to Los Lobos and Lanzarote. Pop into town for lunch. You’ve got two parts to choose from – the old fishing town for straight-off-the-boat seafood and tangled lanes, and the modern town for no-nonsense fish and chips and bar fare. The uninhabited island of Los Lobos is a nature reserve that doubles as a haven for hundreds of nesting seabirds, from chequerboard storm petrels to eagle-like ospreys. It’s also a refuge for holidaymakers. The clear, shallow waters are spot-on for snorkelling, La Concha beach offers up ivory-white sand and views of Fuerteventura, and a walk up its volcano (Montana La Caldera) showcases dozens of plant species like wild agave. Los Lobos is just a 20-minute boat trip away from Corralejo. Lanzarote is just a half-hour ferry ride north of Fuerteventura. Explore the moon-like lava formations and volcano craters of Timanfaya National Park, tour the quirky creations of artist, architect and former resident César Manrique, or catch a concert in the atmospheric Cueva de los Verdes. Alternatively, stick close to the port you arrive in – Playa Blanca. The sandy beaches (both Playa Blanca and Playa Flamingo) are the calling cards of this town, but you can also dive down to the underwater sculptures of the Museo Atlantico or take the family to Aqualava Water Park. Canary Island cuisine combines classic Spanish and Mediterranean dishes with African and Latin American influences. Fresh produce and seasonality plays a huge part in Fuerteventura's menu, with a big emphasis on fruit, vegetables and fish as well as local specialities like goat’s cheese, honey and chorizo. Tapas is a big part of Canaries cuisine, as is fish – parrotfish (vieja) is common, as are giant prawns, crabs and lobster. Flight time from the UK to Fuerteventura is around 4 hours 15 minutes. Like the rest of the Canaries, Fuerteventura is warm and sunny all year round. The temperature rarely drops below the mid-teens even in the winter months, and things only get hotter in July and August, when they often push past 30°C. You’ll find the island’s trade winds take the edge off the heat, though. Restaurant bills in Fuerteventura include a service charge by law in Spain, so whether you choose to tip further is up to you. If you enjoyed the meal and service, it is customary to leave 5-10%. Hotel porters and maids will appreciate a small tip, and while taxi drivers don’t require a tip, it’s common to round up the fare. Can I travel to the other Canary Islands from Fuerteventura? You can easily visit Lanzarote, with the car ferry taking half an hour to travel from the north of Fuerteventura to the south of Lanzarote. If you are interested in island hopping in the Canaries, check out our island hopping page for inspiration.